BIG PILLARS Of Recruiting, Interviewing & Hiring: Winning techniques that will help you hire the best people and avoid those hiring mistakes that can sabotage your organization and your peace of mind. Much has been written on the marketing, sales management, financial and operations management tools furniture retailers need to grow in size and profitability. These skills are vitally important, yet these leading edge retailing techniques are of limited value without qualified people to implement them. Most furniture dealers do not place enough emphasis on recruiting, interviewing and hiring the most qualified people. Before we overhaul processes, we need to “start at the beginning” and look at the value we place on people and how much time we devote to the acquisition, development and retention of “Human Capital”. As Andrew Carnegie, the founder of U.S. Steel and one of the wealthiest people of his time said, “Take all of my factories, my mines and my money, but leave me my people and I will get it all back and more.” With that as a theme, let’s take a look at “Human Capital”. These comments point to the real cost of hiring the wrong people that are not limited to just lost sales and profits. There is all the wasted management time spent turning around a poor performer that could have been directed towards positive initiatives. There is substantial lost time and cost associated with interviewing, hiring and retraining new people. On top of all that, there is a cost associated with the inevitable poor morale generated by poor performers on staff and high turnover. • 46% of new candidates failed within 18 months. • 19% achieved unequivocal success. • Technical skills were not the reason for failure. • Poor interpersonal skills dominated failure. • 26% couldn’t accept feedback. • 23% couldn’t understand nor manage their emotions. • 17% lacked the maturation to excel. • 15% had the wrong temperament for their job. • 11% lacked the necessary job skills. By this he means clearly identify all of the qualities you want an individual to have. Start with your top performers. What makes them successful? Develop a list of successful characteristics. Let that be the base of your “profile” and spend critical time in manpower planning. Pursue an interview probing process that deals with questions in great detail and digs deep down into a subject rather than asking many questions on a wide variety of topics. Because it’s often difficult to get detailed reference answers, here is where you can ask the candidate to call his or her last supervisor and set up your reference call. In this way, they will expect your call and be more apt to cooperate and share their thoughts in more detail. This approach is based on the theory that the way the candidate has acted in the past, and reacts to your questions during the interview, is how he or she will act in the future. If you discover that your prospective employee didn’t get along with his or her team, or made disparaging remarks about an employer or supervisor, or hesitates to discuss how they would handle a requested situation, you can bet that this is how the candidate will perform in the future. Now let’s get back to basics. Before the first classified ad is contracted or the first interview takes place, you should develop a “profile” of the type of person that you want to hire. List the required qualities, characteristics and attitudes (Figure 1). Then match up these with the profile of your current customer base to insure that there is a connection for communication, rapport and trust. Once this foundation is built you can move on to create a specific job description (Figure 2) that lists the responsibilities of the position. Next, write down the tasks that the job description requires and the necessary matching skills required to perform these tasks. 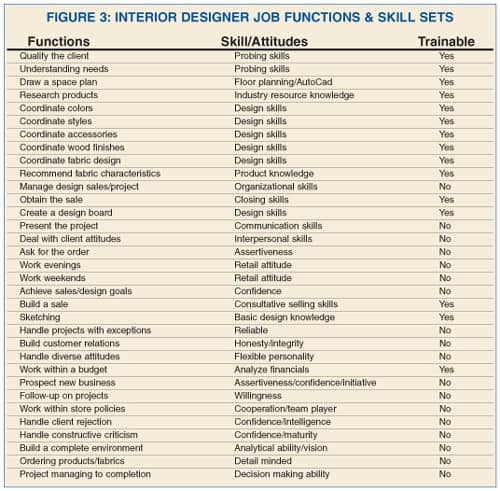 Finally, list which of these skills can be trained and which skills the candidates must bring with them because they can’t be taught (Figure 3). Once you have established the specific target and skill sets, look at the first step in talent acquisition, the recruiting process. Recruiting is a 24 hour 7 day per week job. If you wait to recruit until you need a person, it is really too late. You will be at a disadvantage, be rushed, and will often be forced to settle for an individual who isn’t as qualified because you need somebody “right now”. That’s why developing an on-going file of resumes, applications, business cards and personal notes is so important. This file contains candidates you have spoken to who meet all of your requirements. Build this file as you go about your personal and business life. Every time you buy clothes, a new car or go to a restaurant, you can informally interview and formally observe the real talent and skill execution of the person who is working with you. To make it easy, create a business card designed for recruiting. Such a card could read, “Your professionalism and service has impressed me. We are constantly searching for quality individuals to begin an exciting career in the home furnishings industry. If you are interested in discussing that possibility, please contact me at .…” By handing out the card you convey your impression of their performance, your ongoing search for quality talent and your invitation for them to contact you. However, you may not have an immediate opening. That’s OK! You want to maintain an ongoing relationship with these individuals, letting them know that when an opening arises you will contact them immediately. Employee referral programs have emerged as a major source of quality people. The approach is based on the fact that a current employee wouldn’t jeopardize his or her reputation by referring someone they didn’t trust or respect. This approach also provides recognition to your staff by showing your respect for them and their opinions. This program is more effective when the referring employee receives a bonus if their referral stays a minimum of 90 days. In-store recruiting is another viable approach. Here the premise is, who’s better qualified to represent your store than someone who is willing to spend their money with you? Obviously, they’re comfortable with the store setting, the products and the sales consultant who worked with them. However, you must develop a recruiting brochure that represents your store and career opportunities professionally. Then make those brochures available throughout the store. Institutional recruiting is another productive area. Contact local universities, colleges, junior colleges, community colleges, art schools, design schools, continuing education programs and trade schools. Develop internship and work-study programs with local schools that serve to introduce students to the furniture industry. It will also allow them to get comfortable with your operation, culture and determine if a career in retail home furnishings is right for them. Participate in college career days and community sponsored job fairs. This participation should not be limited to sitting behind a table and talking about your company. You need to be able to illustrate the real essence and value of your brand. Develop a recruiting brochure that lists career opportunities. Bring some furniture to illustrate quality and beauty. Show sample room plans and bring photos of completed design projects so candidates can visualize how they might make a difference in the lives of customers. Letters from satisfied customers and design boards with fabric solutions can be displayed to illustrate the beauty of materials. When working with universities, seek out human resource managers and professors. Develop relationships with the college placement offices. As a retailer I sponsored store tours for students, spoke at high school career days, at design department “lunch and learn” meetings, and contributed classroom materials to university design departments and local schools. There are many recruiting avenues in addition to those listed above. You can advertise career opportunities in conjunction with a model home program, at home shows and when you run in-store consumer seminars. If you are considering doing in-store seminars, check out Margarett DeGange’s series on conducting in-store seminars. The fourth part of the series appears in this issue and parts 1-3 can be found online at www.furninfo.com. Again, what better candidate can you have than one who likes your store and its products? Now that you’ve established recruiting as part of a detailed plan, let’s do some advertising planning. Use display ads instead of simple column ads. Display ads stand out while regular column ads can get lost in a maze of similar looking text. Also use bold type, the color red for attention and have white space surround the ad. Graphics are also effective for getting attention and building on general brand awareness of your store and its products. Consider using bullets, arrows or diamonds to call out or focus attention on specific points of interest in the ad. Once the ad has been created, you will need to choose where to position it. If you are using print media you don’t want to place your ad in the help wanted or “classified” section. This is where your ad can get lost and is exposed to run of the mill.” applicants. You want to make sure that your ad reaches top performers who are not necessarily looking for a position. Ask your top performers what they read, watch and/or listen to. Your print ads may end up being the only ad in the sections of the newspaper that your top people read, but that is fine. I’ve placed display ads in the business section, travel section, sports section, home section, living section, real estate section and special editions of the Spring or garden sections. There are many alternative ad placement areas. Consider trade publications, local business publications, chamber of commerce newsletters, a community newspaper, association publications, school and alumni publications. Take advantage of “built-in” opportunities such as running tag lines after your TV and radio spots offering career opportunities. In addition, most cities have a cable TV community service channel that lists employment opportunities. And certainly, the most popular recruiting channel is the Internet. The top employment websites are Monster, Hot Jobs, Career Builder, Craig’s List and My Space.com. The interview process should be thorough, analytical and well planned. Base your hiring decisions on specific characteristics, skills and attitudes that are matched to the position. Remember; eliminate the “halo effect.” This is where a single characteristic impresses you so much you feel that the person you are considering for a position can do anything, even though there are many abilities that are lacking and skills that are questionable. Employ at least a three interview process and have different managers cross-check answers for maximum effectiveness. Also remember that during the interview process good candidates are evaluating you and your company. That’s why you must put your best foot forward. Set aside a specific interview period with no interruptions. Meet in a private space. Eliminate any communication barriers or intimidators. Utilize a round table or sit next to the candidate without any barriers between you and the candidate creating a relaxed environment. Consider utilizing a “testing company” to provide additional profile data that will help you to make an informed decision. The interview process should be structured whereby you do 75% listening and 25% talking. Use open probes for clarification to generate discussion and provide the candidate the opportunity to discuss how he or she handles various situations. Also look for “red flags” that need more information or additional reference checks. When interviewing, dig into the Four Dimensions of Past Performance. They are: The Level of Performance, Conditions of Performance, Knowledge and Skills, and Attitudes Values and Feelings. Remember the data that Mark Murphy uncovered in talking with 20,000 managers. The time we spend in planning, recruiting, interviewing and hiring is the most critical for any owner. Let’s not forget that we are in the “people business” and they are the foundation of our company. Just think back on the consequences, costs and lost benefits you may have experienced due to a hasty hiring of an underqualified individual. That should serve to remind you that investing the time to find superior people will be well worth the effort. Education: Four year degree in Interior Design, Textiles, or Merchandising from an accredited college or university. Attitude/Attributes: The individual must show a willingness to work in a retail team environment. oriented, that is, the commitment to work evenings and weekends. He or she must be willing to be a team player and accomplish any goals and functions to ensure professional and complete design sales. This position requires an individual to have a comfort level dealing with clients of all economic levels and diverse tastes. This individual will possess superior communication skills to present the benefits of design, and the patience to understand the attitudes of our clients. Interior Designer will be responsible for the design, selling and managing of home furnishings projects reflecting the lifestyle, values and goals of clients. The position requires the development of the total environment by determining, through consultative selling, the specific needs of clients related to space planning, traffic flow, color, fabric, style, accessories and wood finish coordination. The designer will work with both in-store clients and on in-home design projects with emphasis on developing in-home design business. The individual taking this position must have a thorough knowledge of design elements and available resources for project completion. In addition, this designer will have the ability to manage projects to completion within client budget guidelines. This position will also carry the responsibility for achieving profitable sales and design goals through prospecting and new business development. An additional goal will be to establish long-term client relationships through professional performance and by exceeding the expectations of our clients. Ron Wolinski is VP Performance Groups for Profitability Consulting. His expertise in management stems from the positions he has held such as Manager of Training for Art Van Furniture, Vice President of Sales and Marketing with Contact Interiors, President of Behavioral Dimensions, Sales Education for the Simmons Company, National Director of Education and Development for Value City Furniture and most recently, Director of Education and Retail Services for La-Z-Boy, Inc. He consults with retail organizations internationally on Consultative Selling, Communications, Leadership Skills, Organizational Development, Interviewing and Recruiting, and Customer Service. Questions relating to this article or to other related topics can be directed to Ron at rwolinski@furninfo.com.